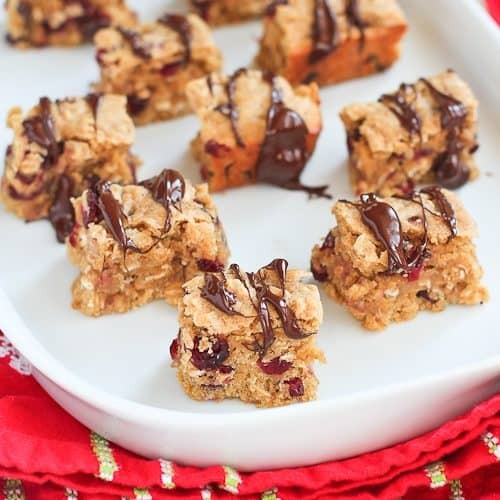 With or without the chocolate drizzle, these Cranberry Oatmeal Yogurt Bars make a wonderful holiday dessert or a healthy afternoon snack. 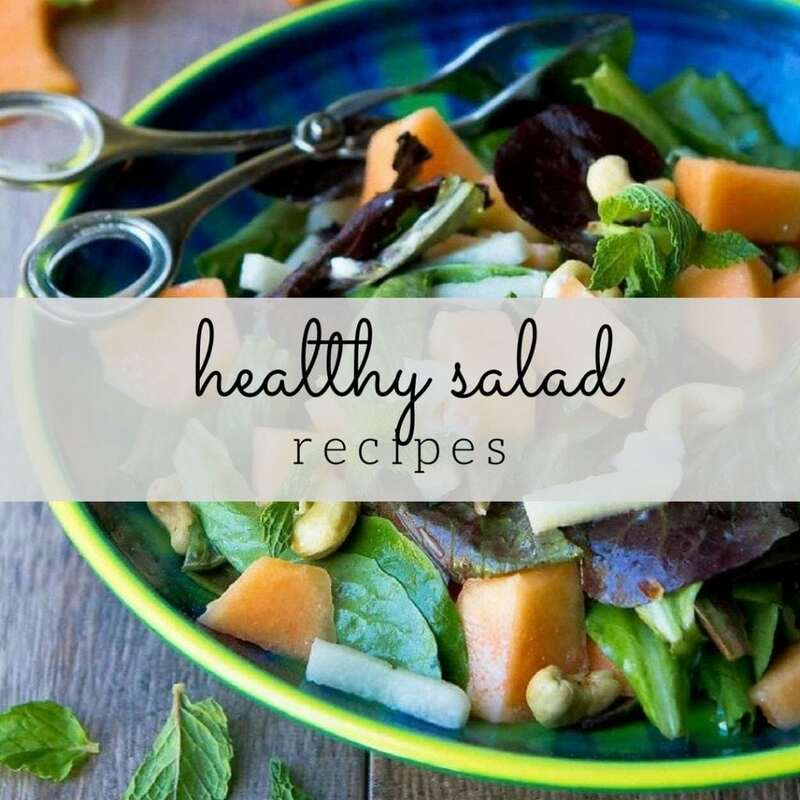 Thanks to Green Valley Organics for sponsoring this post and helping me to share this recipe with you. 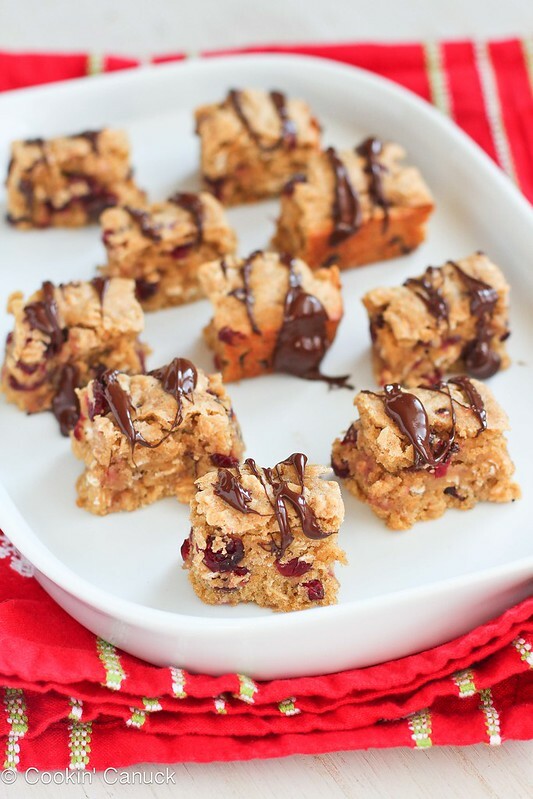 The dried cranberries add great flavor and texture, and the drizzled chocolate makes them perfect for the holidays. That being said, these are just as good without the chocolate. In fact, we’ve all been snacking on these to curb the afternoon munchies. At only 91 calories a piece (112 calories with the chocolate) and a dose of calcium, fiber and protein, these satisfy without piling on the guilt. The texture is similar to a snack cake, without the pounds of butter and sugar. Instead of butter or oil, I used coconut oil and I replaced traditional sugars with a smaller amount of agave nectar. The Green Valley Organics yogurt that I used in this recipe is made with real dairy, but is gluten-free and lactose-free, so is a fantastic option for people with dietary restrictions. 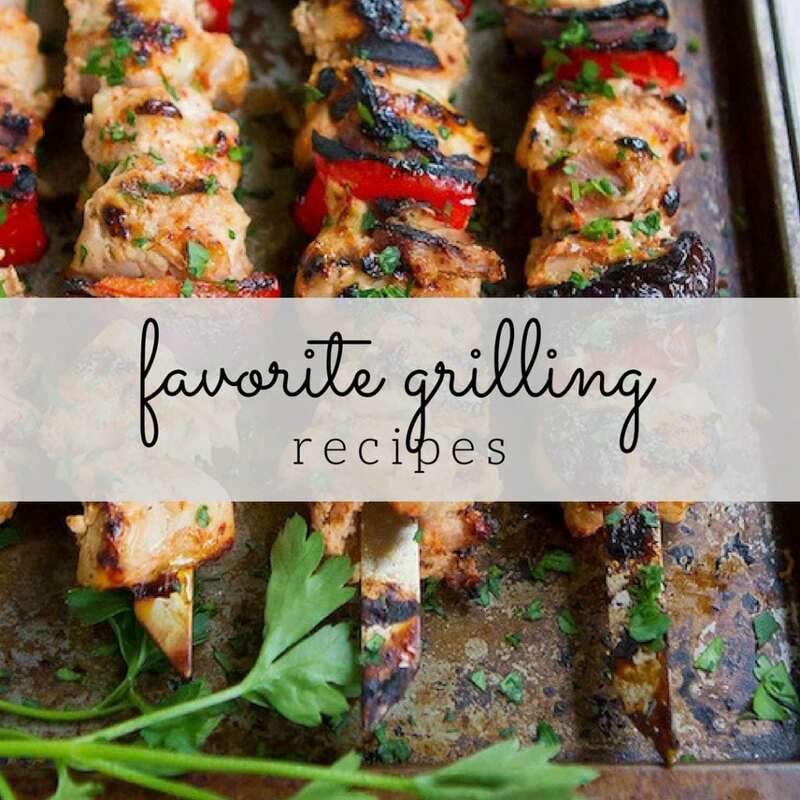 I used the plain yogurt for this recipe, but there are plenty of flavors to choose from. My favorites are the honey, blueberry and peach, and my kids love them, too. There are so many reasons why I like serving Green Valley Organics products to my family. First of all, the products from Green Valley Organics and Redwood Hills Farms (their sister farm) are all organic. The people at both farms are clearly committed to doing everything in a way that is environmentally-conscious. They have a staunch commitment to recycling and the use of solar energy. 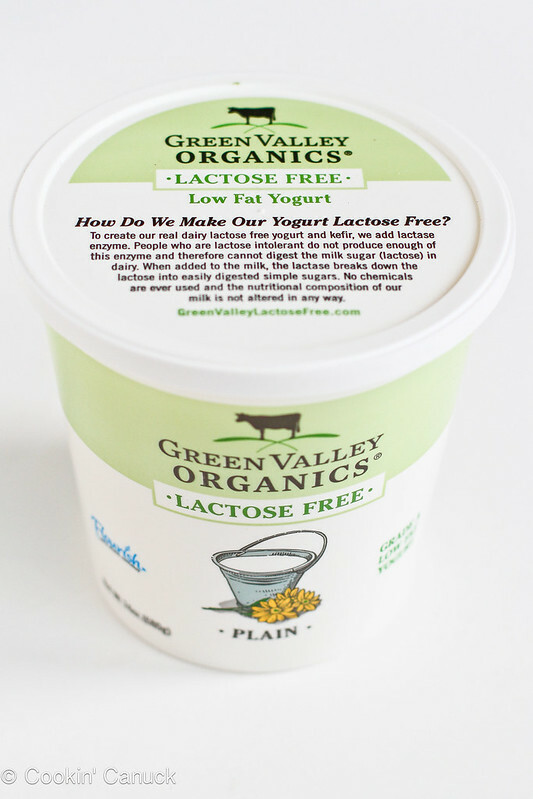 Besides being gluten- and lactose-free, all of the yogurts, kefirs, sour creams and cheeses are free of artificial colors, sweeteners, flavors and preservatives. Green Valley Organics and Redwood Hill Farm products can be found at Whole Food Markets and other health food and specialty stores. To learn more about the products, visit the sites or follow them on Facebook and/or Twitter. Note: To make this recipe truly lactose-free, it is necessary to use chocolate that does not contain lactose. There are a couple of options. Dark chocolates that are certified as “kosher pareve” are lactose-free. You can find kosher pareve chocolate chips at Whole Foods markets. In addition, dark chocolates that contain a higher percentage of cocoa are typically lactose-free. For example, the Lindt 70%, 85% and 99% do not contain lactose. Preheat the oven to 350 degrees F. Lightly coat an 8- by 8-inch baking pan with cooking spray. 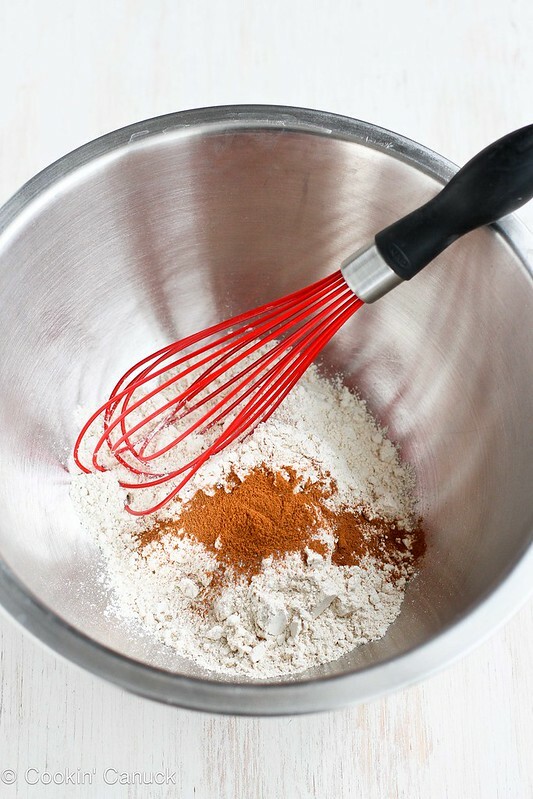 In a large bowl, whisk together the whole wheat flour, cinnamon, salt and baking soda. In a medium bowl, whisk the egg. Whisk in the yogurt, coconut oil (liquid), water, agave and vanilla extract. Pour the yogurt mixture into the dry ingredients and stir to combine. 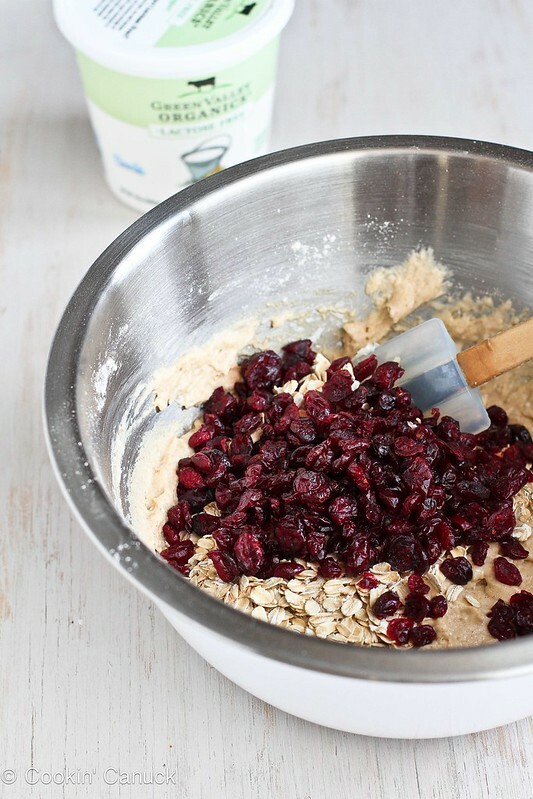 Stir in the oats and dried cranberries until combined. Transfer the batter to the prepared baking pan and spread evenly. Bake until a toothpick inserted in the center comes out clean, about 20 minutes. Allow the bars to cool completely. Cut the bars into 24 pieces and remove from the pan. Place the chocolate in a medium microwave-proof bowl and melt in the microwave on 50% power, stirring every 30 seconds. Drizzle the chocolate over the bars. Serve. Place the chocolate in a medium microwave-proof bowl and melt in the microwave on 50% power, stirring every 30 seconds. Drizzle the chocolate over the bars. Serve. I love that these are under 100 calories and include chocolate! Cranberry and chocolate is such a classic flavour, and very festive! Plus, when a hubby claims that something healthy is moist, you know it’s true. Pinned! LOL. So true, Taylor! He always gives me his honest opinion, which I appreciate. Gorgeous photos and such a festive bar! I love that you snuck a little health into the holidays! Thank you, Tieghan. And I love that these don’t actually taste healthy, so I don’t walk away feeling deprived. This is such an awesome idea!!! I love that you combined chocolate with the dried fruit – one of my favorite combos. Thanks, Liz. I can’t resist that combination either. It’s classic Christmas! Fabulous idea! I just added dried cranberries to my morning yogurt. Now I need to try these bars! Thanks Anna. Yogurt with dried cranberries sounds like the perfect way to start the day. These look so yummy and healthy. I bet the addition of yogurt helps them feel nice and moist. PINCH ME! I can’t believe these chocolate beauties are healthy. 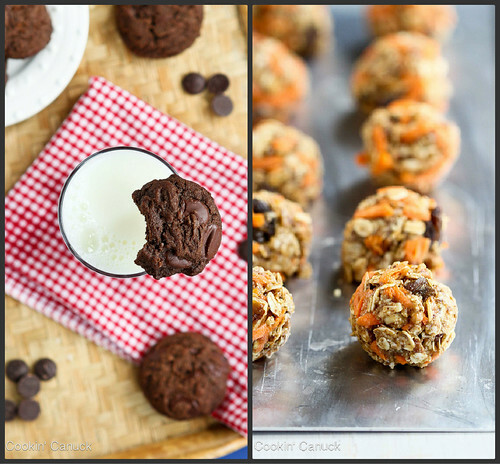 Yogurt is so wonderful for baking, and I love how you’ve used it here. I can’t wait to try that Green Valley Yogurt! Its on my grocery list! 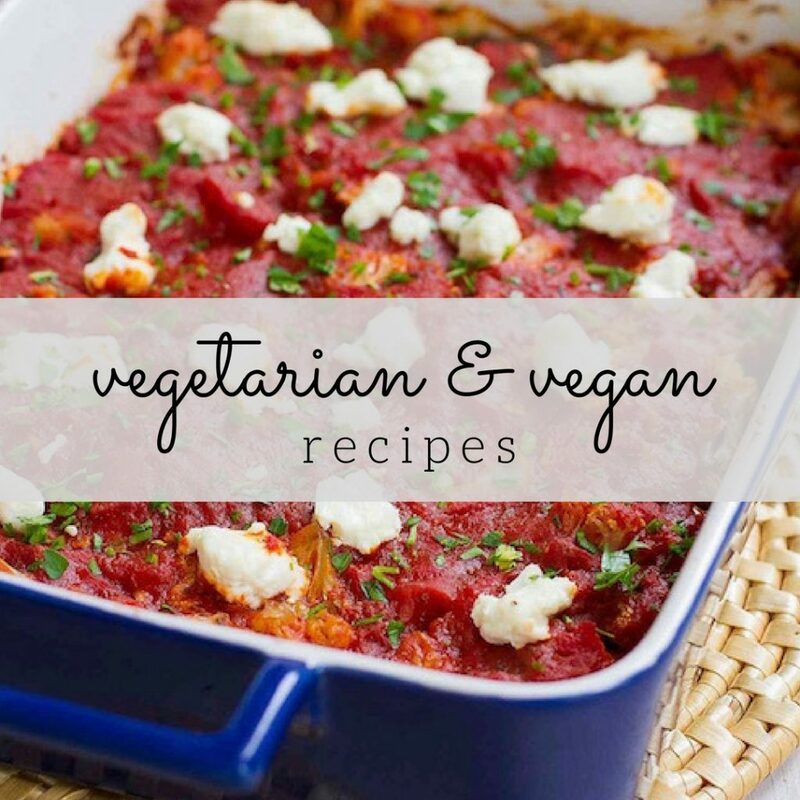 Such a beautiful recipe! 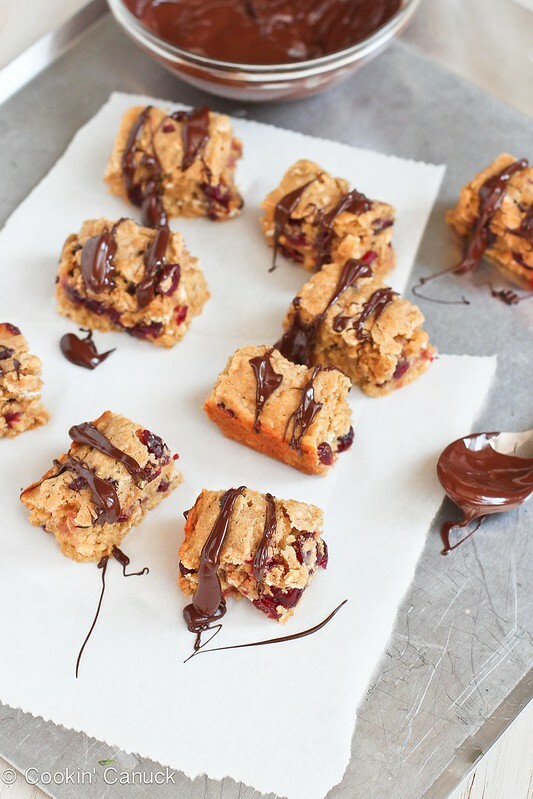 These bars look so good, a perfect afternoon pick-me-up! Dara, these bars are great! I added chocolate chips into the bars instead of the chocolate drizzle on top. They were delicious! Thank you so much for sharing the recipe.